Shortly following the events of 9/11 an American Flight Attendant, Valerie Thompson, formed a foundation dedicated to the memory of the professionals who crewed American Airlines Flights 11 and 77 and United Airlines Flights 93 and 175. On July 4th 2008, the 9/11 Flight Crew Memorial was dedicated in Grapevine, Texas, just north of Dallas Fort Worth International Airport with almost a thousand in attendance. The City facilitated the gift of the site from the Westwood Development Group and has provided landscaping, parking and benches. The site is located on the SW corner of Northwest Highway and Texan Trail in the new GrapeVine Station Development and provides outstanding access to the public. The 9/11 Flight Crew Memorial Foundation donated the Memorial as a gift to the City which incorporated the Memorial into their parks system. The Memorial is a bronze sculpture based on the design of Bryce Cameron Liston of Salt Lake City ,Utah and sculpted by Dean Thompson. It is executed in the Grande style which is one and one half life size. 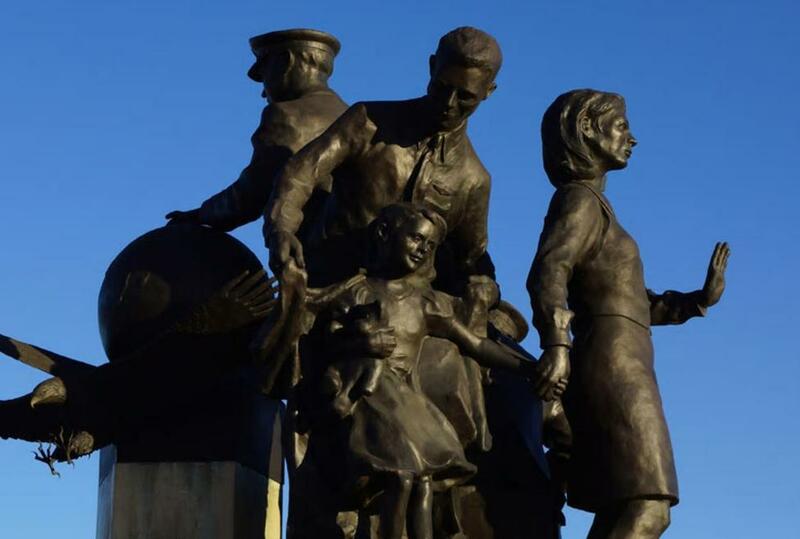 The Memorial has five figures; two pilots, two flight attendants, and a child representing the traveling public. The figures are 14 feet high and with the base stand 18 feet. It is sited facing west on a compass rose. Engraved pavers encircle the site. The figures stand on a single block of white Texas limestone. The names of the crew members of the 9/11 flights are engraved on slabs of granite surrounding the base. It is truly beautiful and awe inspiring.